$150 per day; 4 day minimum year round. Reservation deposit of $150(unless 21 days or more) Security deposit $400. Rates starting at $150 per night or $799 per week. 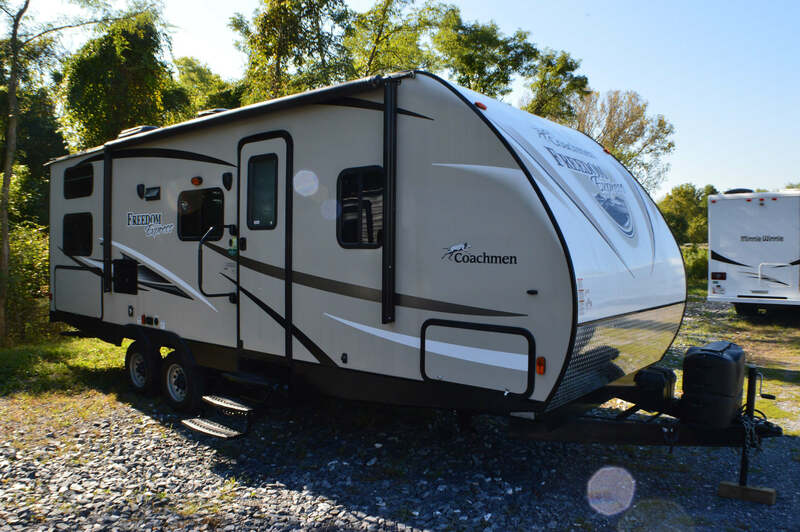 In this special edition Freedom Express travel trailer 25SE by Coachmen RV you will find a rear bath, rear double bunks, and a u-shaped dinette, plus much more! Step inside to the right to find a front bedroom with dual sliding doors for privacy. Inside, there is a queen bed with wardrobes for storage on either side. There is also a large overhead cabinet for additional items. Heading back to the combined kitchen/living area you will find an entertainment center along the interior wall allowing easy viewing from anywhere. There is a u-shaped dinette slide along the road side which allows for plenty of room for dining or even sleeping when made into a bed. Across from the slide find everything you need to prepare and cook meals with a refrigerator, three burner range including a microwave oven, and a double kitchen sink on an angled counter-top for easy cleanup. There is also overhead storage for dishes and things. Next to the dinette is the pantry for your non-perishables. A rear corner bath includes a toilet, sink, and a tub/shower. There is a wardrobe just outside the door. A double size set of bunks is next to the bathroom providing sleeping space for four. Enjoy exterior storage in the rear below the bunks, and also in front with a complete exterior pass-through storage compartment accessible on both sides, plus so much more! 21 days or more require the (1) week deposit. Length: 28 ft. 7 in. Interior Height: 6 ft. 6 in.